We received tickets for a 5-Wits adventure in exchange for this review. All opinions expressed are my own. When we learned of a 5-Wits opening in our town, it sounded like something fun and interesting for our whole family. We weren’t quite sure what the 5-Wits experience would be like, and were looking forward to a unique adventure! Depending on the 5-Wits location you visit, there are different adventures to choose from. I let the kids choose, and they decided on the “Deep Space” adventure. The other choices include Drago’s Castle, Espionage, Tomb, and 20,000 Leagues. My kids are 7 and 9, and I felt that Deep Space was a good option as we had some recommendations to go with that as the best fit for a younger child. You can pay ahead of time online, or in person. 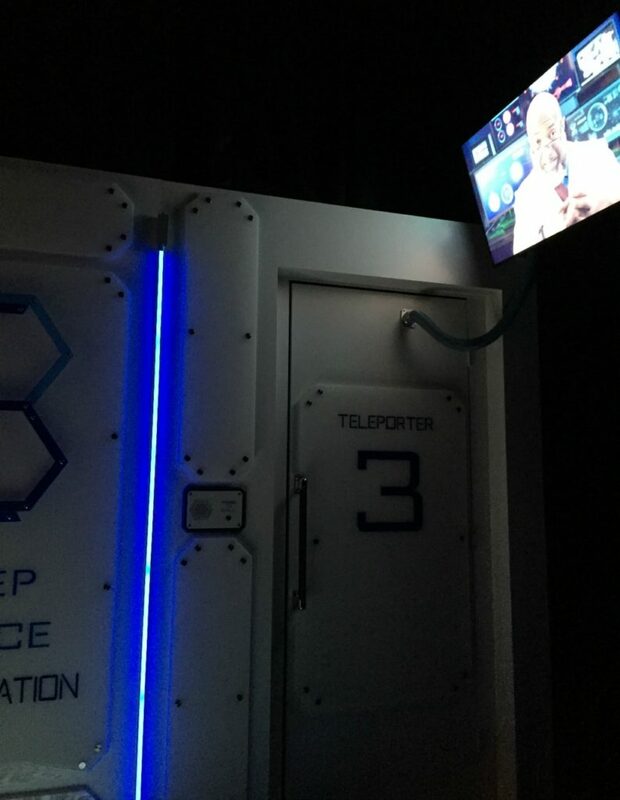 Our Deep Space adventure could vary from 20-30 minutes (depending on how long you take to do the challenges), so we made sure we were comfortably dressed, and that the kids had used the restrooms beforehand. We brought in what we had with us (jackets, purse, etc), but there are both lockers and restrooms available if needed (I would recommend waiting to do your shopping until after, or leaving anything big in the car). We got our tokens and got into line to start our adventure. A group was still inside, so we had a short wait before entering. While we waited, we checked out the score board (which also counts down how many minutes are left until your group can enter). 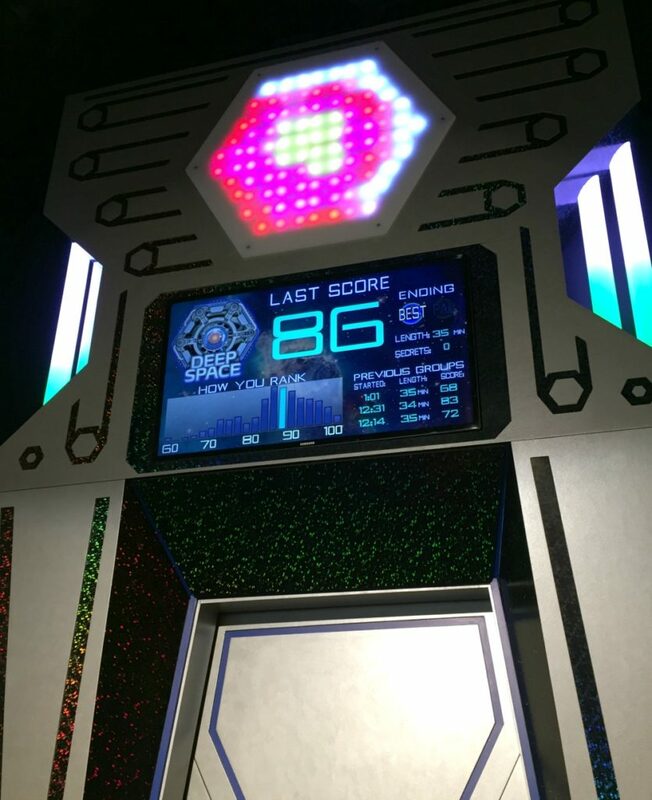 We were interested to see what other group’s scores and times were, which is also cool to check out once you finish too. The kids were bursting with anticipation – and then it was our turn! The doors opened, and a guide took us down the hall to where we would begin our adventure. We had an on-screen “debriefing” before heading off on our own! 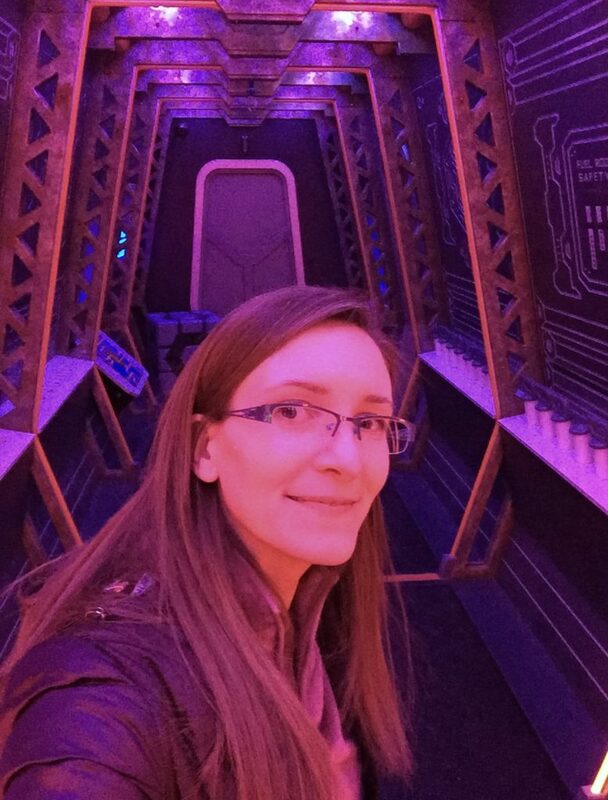 We stepped into our space ship – and here is where I didn’t what to expect. We were in a room, with lots of buttons and controls, and no idea where to begin! How much fun is it to have to figure everything out? My kids were thrilled to be in a room full of mystery buttons and gadgets, and we all got to work. Soon enough, we were steering our ship and blasting lasers to protect our spacecraft. My daughter took her asteroid-blasting duties very seriously! Working together as a team, we successfully averted near disaster, and the doors opened up to reveal our next room. The service bay had some really neat challenges. And the special effects were pretty cool! Then it was on to another room. It was fun to be immersed in these cool environments, which do really make you feel like you are in the game or on a movie set. 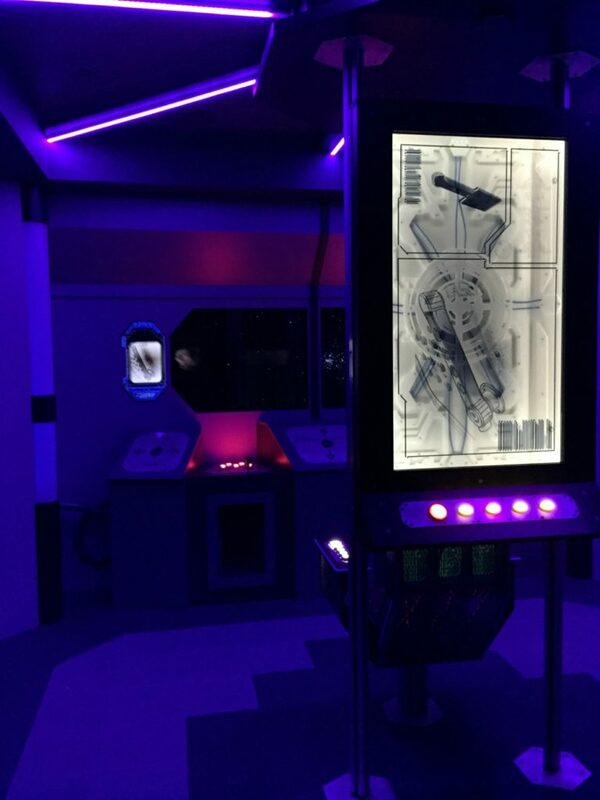 One of the things I liked about the Deep Space experience is that we all worked together as a team, and there was something for everyone to do. 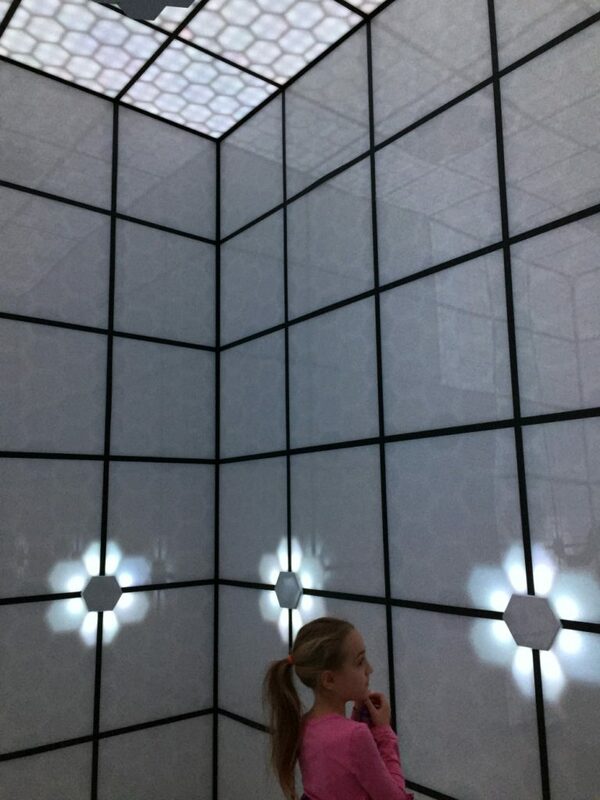 It was fun to experience the different physical spaces and see what we could come up with to solve the puzzles or tasks. I wasn’t sure how my 7-year-old would feel about the whole experience – would it be too scary? Her verdict: she had a great time and already wants to try another adventure! There were some moments where the lights went out (as we expected), but she had stayed within arm’s reach and was fine. 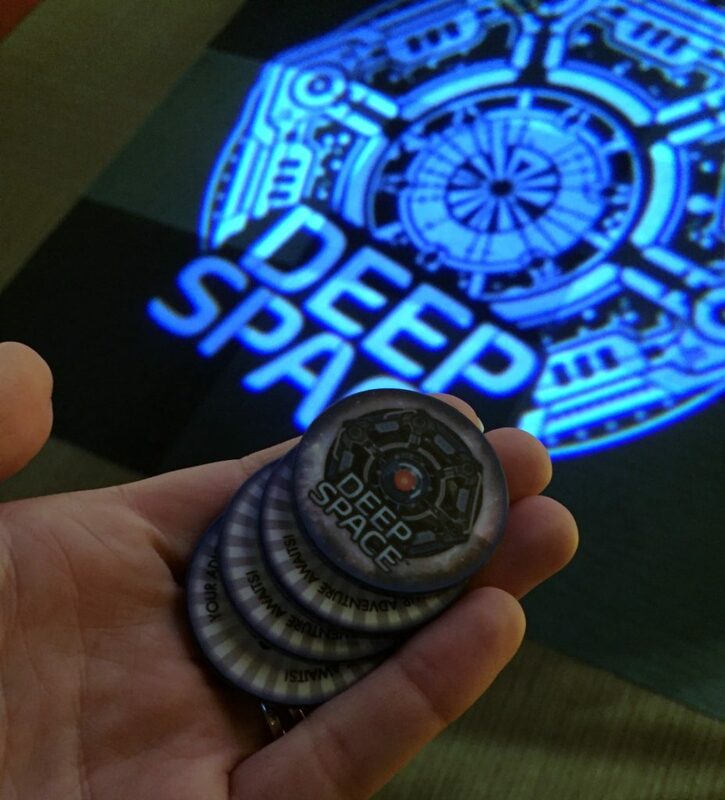 We did go on a recommendation that the Deep Space adventure would be the best choice for a younger child, so I would probably suggest starting with that if your child is younger or nervous. The staff does monitor the adventure rooms, so if there is ever an issue, they are right there for you. Both kids are already talking about going back again and how fun it would to be with friends or for a birthday party. 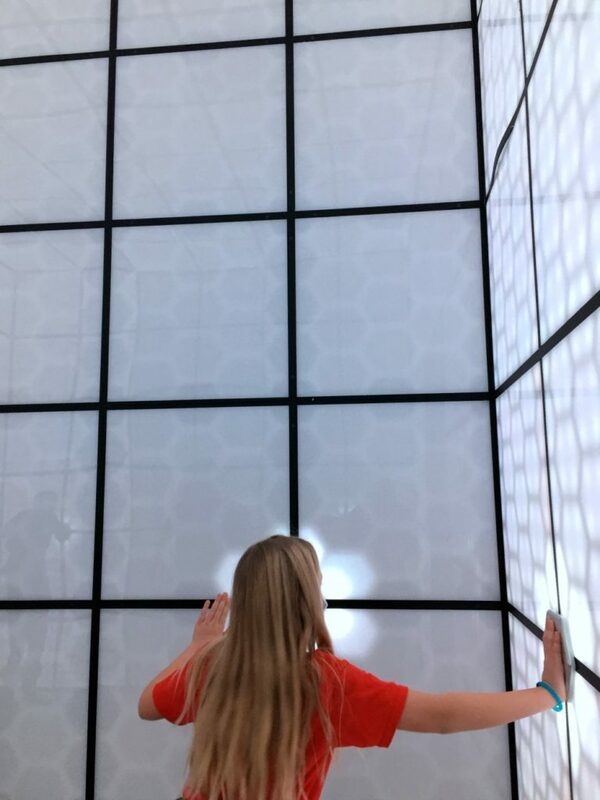 5-Wits is definitely fun for the whole family, because there are so many components going into this – the cool staging of the rooms, the special effects, the puzzles, etc. A great way to do something a little different and go on a real adventure! 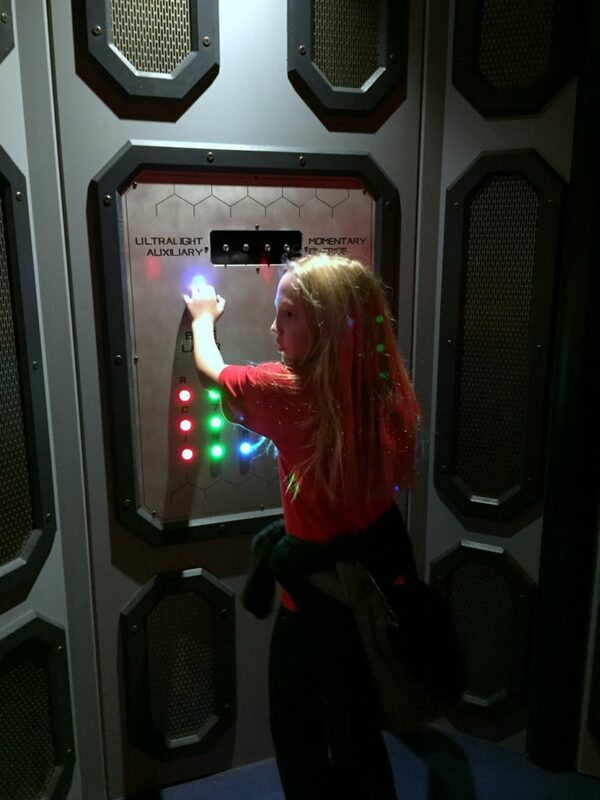 It’s fun that you got to touch the buttons and figure everything out. I’d like that too. 5-Wits sounds like so much fun! This is the perfect place to take kids to get them excited about learning. Hands on is always best. That place sounds like a blast! I wish we lived closer up to it because I would’ve loved to check that out with my child. My grand kids love figuring things out, they’d love this. I’m going to send them the link to your post and I’m sure they’ll want to go. It looks like y’all had the best time and I’m sure you enjoyed it very much. That is so cool! I love how hands on it is there. It looks like a great time and a wonderful way to get the kids’ imaginations going. I love this. I wish they had something like this year in my home town or at least a nearby city like Phoenix. 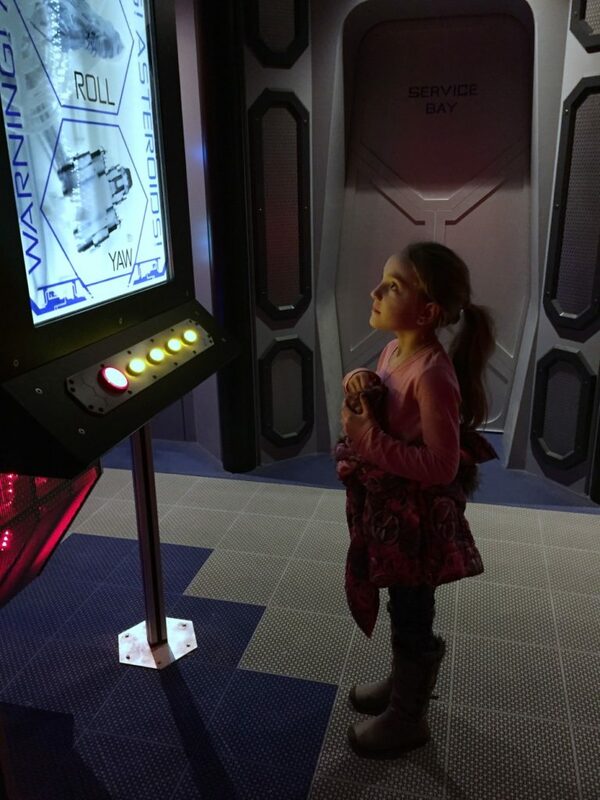 My oldest absolutely loves all things space. We have been wanting to try something like this. It looks like so much fun for the whole family. I will have to look for a 5-Wits near me. My family would love this. I will have to look into finding this in my area. I think it is a great way to build teamwork skills. What a fun family time you had. Is this something that you can do anywhere or is it just in certain locations? I bet the kids had a grand time and looks like you did, too. Happy new year! This looks like a super fun place for the kiddos. My granddaughters woud love this place, for sure. I have never heard of 5 Wits before but it sounds like an fantastic place to bring the kid as family adventure. Deep Space would be something I know my nephews would really love. This is something I will have to share with my niece and my sisters for their kids. Thanks for sharing your awesome family adventure. I can see why your kids had a blast. It looks so awesome in there. My kids would love to do something like that. Looks like a lot of fun for the whole family. We don’t have this in my place, I wish there is. That looks very cool. We love escape rooms and this looks like it takes it up another notch! I haven’t ever heard of this place before today. It sounds like so much fun and I bet my boys would love it too. Too bad they don’t have one close by. This is so awesome! My children would love something like this, especially my son. My city needs something like this! I’ve never heard of this! It sounds amazing! I think my kids would enjoy it, but I know my husband would LOVE it. Lol. We’ll have to find one. I think it’d be worth traveling for since I doubt there’s one close. Talk about being in a cool place, this is my definition of it! I would say the same thing even if I wasn’t seven, haha. I’ll check their website! That looks exciting and so much fun! Our son will have a blast there, for sure. Wish we have one like that here in the city. This is really cool! I have not heard of 5 Wits but I have seen similar gaming type establishments popping up here and there. Looks like a great deal of fun. That’s a neat way to spend an afternoon. Lots of fun activities that will keep the kids excited and you can’t go wrong when you play as a team! This is exciting! I’d love to take my kids there. Thanks for sharing. This looks SO FREAKING FUN! Both of my kids would go nuts for this! We don’t have anything like that here around us but it looks like your girls had lots of fun! My boys would go CRAZY over this. I wish we had something like this nearby because we’d so totally go. This sounds like such a fun experience! This sounds like a great place for kids to learn and explore! This sounds so much fun! I love places that make our children get active physically and mentally! Wish we had something like that around here! This sounds so fun! I’ve been holding off because I wasn’t sure if it would work for my almost seven-year-old, but it sounds like this would work for her too! I’ve always wanted to do an escape room, but this looks sooooo much cooler than the normal ones! I’m going to have to check out if there is something similar in my area. My kids would love this place. It would be so fun to solve the clues. This sounds like a great experience to include children in. I’ll definitely keep it in mind for my niece and nephew. That place looks like so much fun! I knew if I was 5 years old, I would have BLAST! Love this! I bet I’d enjoy spending a day here. Looks like so much fun! 5 Wits seriously sounds like so much fun. My kiddos are very hands on so this sounds like something they would have a blast with. Wish we had one closer to us. I have never heard of this before, but it looks like so much fun! It also seems like a great way to team build and build a stronger bond! Great post! Wow! I have never heard of this and it sounds absolutely amazing! I am going to need to look this up and see how close one is to us! This looks like it would be so much fun! I love places like this to be able to explore. This looks somewhat like an escape room! We had so much fun doing the space themed escape room here!!!! That place looks SO cool! It kind of reminds me of a sci-fi version of this place I went to in San Francisco as a kid. It was this giant interactive play space based off the book Where The Wild Things Are. I was amazed the first time I went. Definitely want to explore this place too! I have never heard of 5 wits before today. It looks like a really fun experience for the whole family. I love how you interact with it. Wow this looks really interactive. Looks like an amazing family event and outing to go to! I wish we had something this adventurous in our city! This looks like a great way to spend a day with the family! This place sounds amazing. The entire family can have so much fun there. I love that it is interactive. I have never heard of it, but I would love to go there. It’s fun that you got to touch the buttons and figure everything out.What a great experience! Love it!